Discover the Lourie Center for Your Next Event. Whether you’re hosting a wedding, business meeting, or simply have a special occasion to celebrate, the Lourie Center has ample and flexible space for any event, with two ballrooms and six classrooms. We are located in Five Points, just minutes from downtown Columbia and adjacent to the University of South Carolina. Your rental fee includes the furniture set-up, basic use of the kitchen, a staff person on site during your event, and the cleanup afterwards. Stage, TV/DVD and digital projector are available for additional fees. Food, entertainment, linens, flowers, decor…it’s up to you. Even better, there are no charges or restrictions on your local vendors. We do require that all caterers provide proof of insurance. We are located near the intersection of Blossom and Pickens in Five Points, next to Maxcy Gregg Pool, adjacent to the beautiful University of South Carolina campus. Formerly the Capital Senior Center, we offer modern amenities and plenty of free parking. 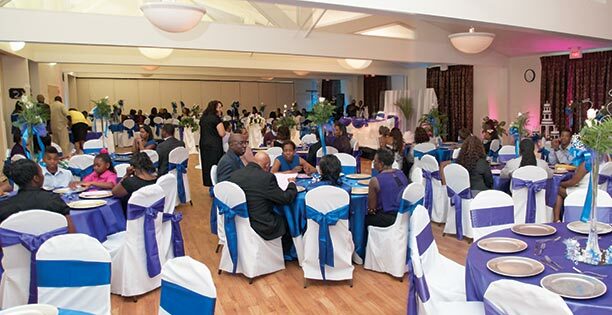 Our facility can accommodate a small meeting of 10 up to a large party of 300. Rent only what you need! Room rental fees are per hour of use and are affordable. We are open until 12 midnight. A refundable security deposit is required. Facilities book quickly, so make your reservation as soon as possible. Call our Rental Coordinator Geneva Dean, at 803-779-1971 x 104 (Mondays-Wednesdays-Fridays, 9 am – 2 pm). Want to make a payment on your space rental? Call the Lourie Center office to pay with a major credit card. Stop by during administrative hours with cash, check or credit card. A variety of organizations have discovered the Lourie Center is a great venue to hold their regular meetings.